Usually, after any major scanning project is completed, you will need to keep on top of incoming documents and making sure that you keep all of your files consistent, in the same place and in order. After all, one of the major benefits of having them all digitised in the first place was to improve your organisation, the way you work and the ease of access for all your files. So, it would be silly to convert the bulk of your documents and then lose the organisation through poor new file document management. If you continue to have a larger amount of documents coming in on a monthly or yearly basis, then it’s recommended to have them dealt with continually by your document scanning company as the ongoing costs and time spent on the digitisation will be considerably less than if you do it yourself. There are other methods if you have a smaller quantity of documents, around 10 to 50 per month, coming in that need digitising but we will go into that later. Why is it important to maintain your new document management system? Once a system has been implemented and it begins to dramatically improve things, it is always a good idea to keep at it. Document management systems are usually adopted for one major reason and that’s to improve organisation as well as productivity. Arguably they are two separate reasons but in business they tend to become one and the same and one usually leads to the other, so it’s important to maintain a new found system that works. Sending more of your documents off to be scanned might seem like you’re going around in circles but the relatively low cost of having your documents digitised will make your company or department more productive as well as saving, and continuing to save, a great deal of space. It can be very easy to slip when it comes to something like document management as it can sometimes seem a bit of a hassle to maintain it, but it really doesn’t need to be. Once read, used and perhaps no longer required, all incoming correspondence can be added to one particular area of your office to be sent off and scanned when the time is right. You can perhaps have a pile for documents that need to be added to your EDMS (Electronic Document Management System) as well as a pile of documents that don’t need to be added to your EDMS so need to be recycled and disposed of. 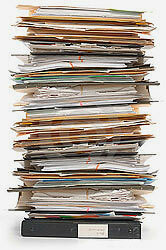 If you take in a lower quantity of documents on a regular basis, say 10-50 per month, there are other solutions. If there is not an urgent need for these to be added into your EDMS, then you can simply add them to a pile and wait for the documents to reach an appropriate amount again before sending them off to be converted. However if you’d like them adding into your system as soon as possible, there are other solutions. Pearl Scan’s invoice processing software is an option, however solutions can be provided for ongoing projects dealing with more than just invoices. This type of software can offer everything you need such as automated indexing, OCR and other useful facilities which help you to keep on top of your documents as well as search and find them without issues. Our services are tailor made for you so please enquire about the services you require and we can provide the service you need. There are also portable scanners out there offering differing quality for lower document quantities but as we have mentioned before, it’s always recommended to outsource your document scanning where possible. Most scanning companies including ourselves offer great rates for ongoing scanning, less than you might actually think and, in turn, provides a more accurate and convenient way of having files digitised without the need to fork out on potentially unreliable office scanners. Staying on top of your documents is easier than you think if you follow the steps above. Let us know how you maintain your digital zen! If you would like some more information on the services we offer here at Pearl Scan, browse our website or get in touch today for a free, no obligation quote for your document scanning project.